Sometimes, one needs a Windows image file for research or repair purposes. It’s easy to grab current Windows ISO files from the Download Windows 10 page at Microsoft. But when it comes to older images, some improvisation may be necessary. In February of this year, I blogged about one such tool — namely, the HeiDoc.net MS ISO Downloader. 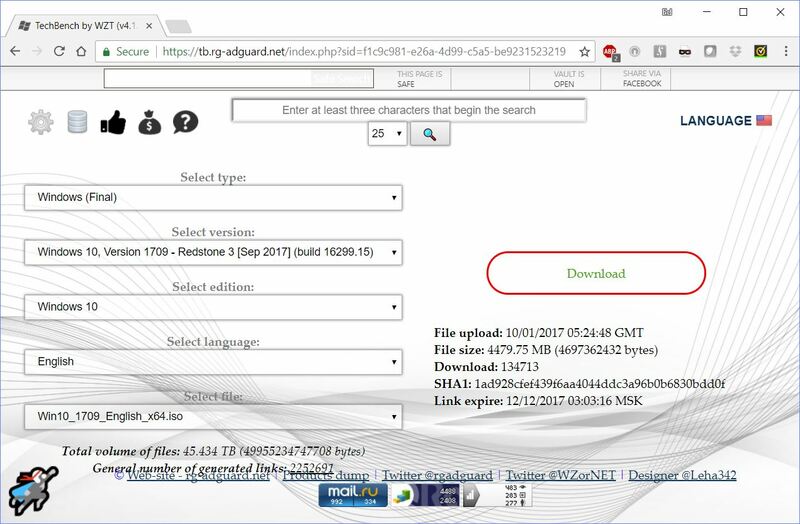 In this blog post, I describe how Adguard offers a Win10 ISO alternative download source. It ties itself to Microsoft TechBench (itself no longer directly available). Thus, Adguard grabs all its downloads from MS servers. This web-based download tool requires you to pick release type, version, edition, language, and bittedness to select a specific download. If Adguard Offers Win10 ISO Alternative, Is It Worth Using? Adguard comes from the shadowy WZOR organization, and is based in Moscow. Check out their Whois data to see what’s up here. This may give some pause when turning to a source for Windows image files, but I’m not unduly bothered by it. That’s because even though the download instructions come from Russia, the download files themselves come from Microsoft (and come up clean when checking for malware, or for changes to hash values). I still prefer the HeiDoc ISO downloader myself, but I’ve added this to my favorites, and will use it should I need a specific (older) image and be unable to find it elsewhere.